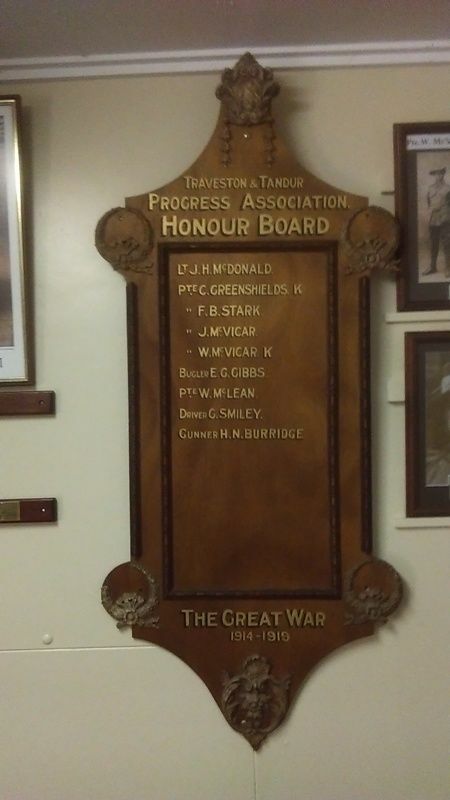 Traveston & Tandur Progress Association Honour Board lists those from the district who served in World War One. Honour Board — There was a very large attendance in the Traveston School last Saturday night, on the occasion of the unveiling of the honour board erected by the Traveston and Tandur Progress Associations, in honour of the local boys now at the front. The evening was spent in dancing, and during an interval Messrs. J. Moore and J. Twoomey addressed those present. An apology was tendered for Mr. and Mrs. H. F. Walker who were to have been present, but were detained in Gympie. In the absence of Mrs. Walker who was to have unveiled the board, Miss McVicar performed that duty. Cheers were called for the boys at the front. The board is a very neat piece of furniture, in carved maple, and has inscribed upon it the words, " Traveston and Tandur Progress Association Honour Board," followed by the following names :— Lieut. J. H. McDonald. Privates C Greenshields, F. B. Stark, W McVicar, J.McVicar, W. McLean, Bugler K. G. Gibbs and Driver G. Smiley. Gympie Times and Mary River Mining Gazette (Qld), 12 August 1916.